An enlarged version of a Master thesis for a M. A. degree in European Studies (University of Flensburg / Germany, International Institute of Management and European Studies), this book based on a lot of sources, interviews and other empirical research shows a thorough scientific depth. 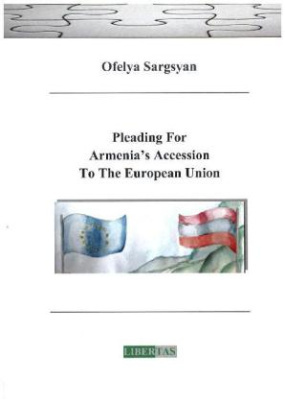 Besides it is the first book in the literature landscape by any - in this case Armenian - author pleading openly for an Armenian membership in the European Union. When writing this study, the author wanted originally to describe a more or less slow changeover of Armenia towards the EU, when not only she was surprised by the announcement of the Armenian Government to join the Russia-led Eurasian Customs Union on 3rd September, 2013. This has already induced furies within Armenian politics and above all civil society, and the result at present - before the Vilnius Summit of the Eastern Partnership at the end of November 2013 - is open.§But one thing is for sure: If Armenia would go indeed into the Customs Union and later into the Eurasian Union, the results, the economic benefits, the neglecting of necessary reforms, the treatment of matters and of personnel will create a backlash in Armenia (and the EU) which will be the basis of more solidarity than ever with the legitimate security interests of Armenia, possibly with the support of the EU. This backlash will endorse a future, new approach towards the EU.§Ofelya Sargsyan writes why: Armenia is well-anchored in Europe, since almost 2000 years, and it had more to do with European capitals like Paris, London, Brussels etc. in the 2nd half of the 19th century than people think. Of course, it would be a European border region, but together with Georgia - which also strives into the EU - it could be just this. The book deals with geographic, political, economic and cultural reasons, why Armenia should follow a clear foreign policy towards Europe - which has not at all to collide with special and privileged relations to Russia.§The impressive history of the country's relations to the Council of Europe and the EU is well described, as well as the EU's perception of its hypothetic move. But also the positions of Turkey, Azerbaijan, Nagorno Karabakh and Iran as well as of Russia and of course Georgia are described as those of neighbours interested in the regional integration orientation of Armenia.§The author, belonging otherwise to an "impatient" young generation, knows perfectly, that the EU membership takes a lot of time, but she pleads - in an outspoken, but never "pushy" way, for a sustainable change in Armenia's foreign policy - a change which since more than 20 years of Armenian independence would not have to be a real change, after all.